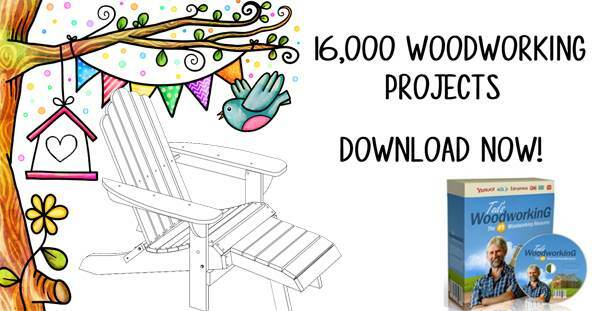 Combine a planter and a comfortable bench for your patio or deck with free planter bench plans that are easy-to-build and attractive additions for your home. 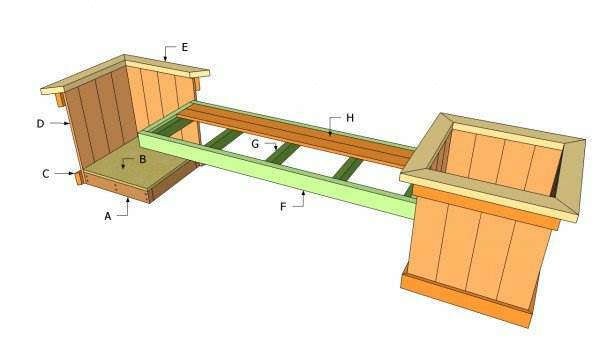 Use clear pine for an economical seat that can be painted or stained or choose cedar or redwood for beauty and durability. Customize the plans to the size of your deck or patio, and use complementary building materials for a built-in, designer look. 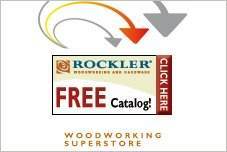 Treated lumber is practical and weather resistant, so your planter bench will look good and require little maintenance. Use exterior stains or a wood sealant to protect your piece and be sure to use stainless or galvanized fasteners to prevent rust and corrosion. 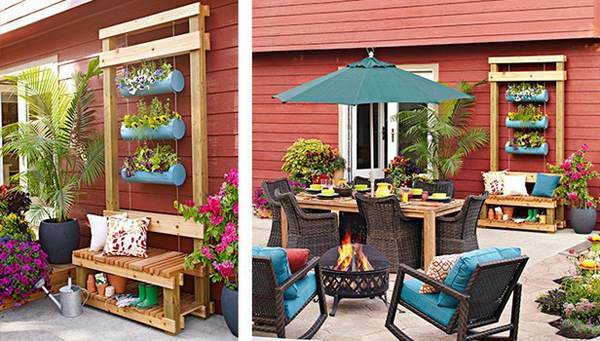 Add a spacious L-shaped seat to your deck that provides ample room for guest and flowering plants. A simple seat with a planter on either end is charming and would look great tucked into a quiet corner of the yard. The wide rims and base trim of these planters gives a refined and sophisticated look to a simple planter bench. Use a stain and exterior polyurethane to give the seat a stylish look. 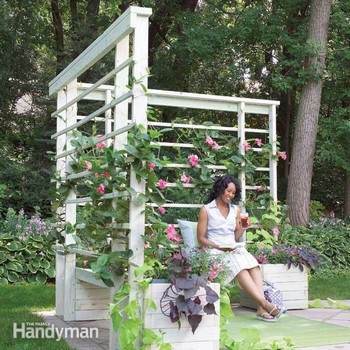 Create a charming getaway in the corner of a garden with this clever L-shaped bench that features built-in planters and an arbor on which to grow vining plants and flowers. Suspended planters hang from a sturdy wooden frame that is attached to a convenient planter bench. Set against a wall, it makes a decorative accent to your patio or deck. This bench has two cutouts for plants, which grow in pots placed under the seat. The open bench allows the planters to show, so use colorful pots to add a bright accent. 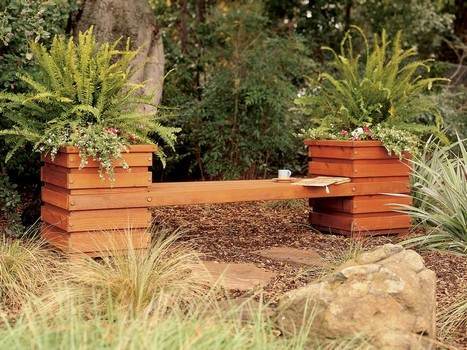 Use cedar to create a simple, slatted bench and matching planter boxes. 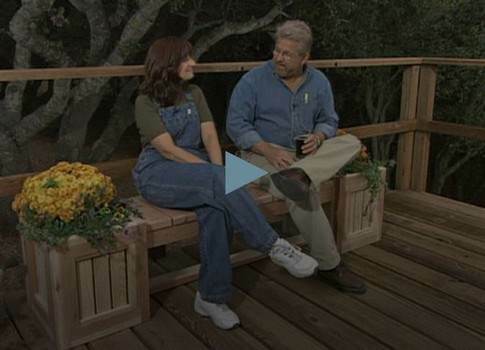 This basic instruction allows you to adapt the plan to fit your deck or patio. This lovely outdoor bench is designed with a box planter on each end and makes a lovely addition to your lawn or garden.